The lights fade in the Sandburg Theatre on David Drazin, an acclaimed silent-film pianist. On September 24, 2013 under the orange glow by the grand piano, David Drazin began to accompany the silent film Safety Last. 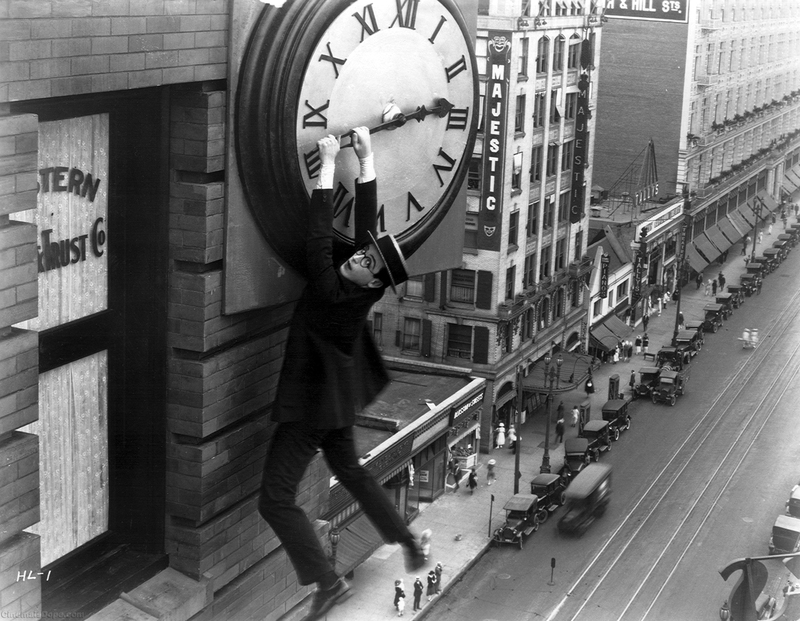 This 1923 silent comedy, features many terrifying stunts including climbing a building to hanging from a clock tower. It is also filled with humorous gags. Safety Last features Harold Lloyd who plays a boy. Harold Lloyd at switches roles with the stunt artist and has to climb a building. Harold Lloyd is a heavy-hitting actor in the silent era. He was as well known as Charlie Chaplin and Buster Keaton, starring in over 200 films. During the film, David Drazin subtly changed the mood throughout the scenes. He began to paint a musical picture that mirrors the movies ever changing scene from the serious moments to the humors moments. The moment the film began the audience was captivated by both the images and the experience of a silent film accompanied by live music. After the feature screening, Dr. Richard Ness threw an unexpected curve ball to Mr. Drazin. Soon after Safety Last finished Dr. Ness began another classic short Gertie the Dinosaur (1914) by Winsor Mckay. This film features Winsor Mckay as an animator as he brings a dinosaur called Gertie to life with animation. Drazin kept right up, improvising a stride piano style to match. As the night came to a close, Drazin received a thunderous applause as he had just completed a musical marathon. By the end of the night, David Drazin was covered in sweat and was ready for a well-deserved break. After both viewing a reception was held in the Sandburg Lounge where guests were able to asks questions about the music making process. David Drazin, grew up in Ohio and specializes various jazz styles such as Harlem Stride, Bebop and Blues. Drazin routinely plays for blues, jazz, and film festivals, and he has played for numerous organizations from coast to coast. Besides accompanying for silent films he also accompanies for ballet classes. After moving to Chicago in 1982 he continued to play for ballet companies, but in 1985 he began to play for the Chicago School of the Art Institute for Film. A key achievement for Drazin occurred when he accompanied The General (1926) in 2010 at the National Archives in Washington D.C. This event had numerous sponsors including the Department of Broadcasting, Department of English and Journalism, Council on Student Activities Funds, and the Visiting Lecture Committee. Dr. Richard Ness, a professor of Film and Broadcasting , worked extremely hard to bring this event to life.